Reduce phone costs, improve connectivity, and secure your telecom and network equipment with Multi-Link’s ACP Series 2.0, Out-of-Band Network Switch & Call Router. The ACP Series 2.0 enables businesses to communicate with remote telecom and network assets more efficiently and securely while cutting costs. 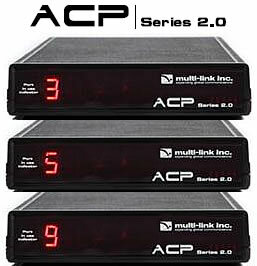 There are 3 models is this series— ACP-300 (3 device ports), ACP-500 (5 device ports), and ACP-900 (9 device ports). The ACP 2.0 units allows up to nine telephony devices to share a single telephone line, eliminating costly phone lines and saving up to $400/month per site. Businesses with multiple remote sites can realize a significant ROI in 3 months or less. The ACP Series 2.0 automatically routes calls to phone, fax, or dial-up modems, ensuring that the right resource is reached the first time. This consistent connectivity prevents time-consuming dial-backs and streamlines polling and data acquisition processes. In addition to cost savings and precise routing, the ACP 2.0 is engineered to provide an additional layer of security to connected devices. Vulnerable pathways to equipment via the PSTN are protected by programmable Security Access Codes up to seven characters. There are over 35 million combinations to choose from, effectively creating a telephony firewall for dial-up connections. The ACP 2.0 installs on an analog phone line and answers inbound calls at the first sign of ring voltage. After the ACP 2.0 goes off-hook, it immediately screens for fax and security access codes (SAC). During this processing period, a Bell spec “ring-back” tone is issued to the calling party. Once a SAC command is received, the call is routed to the corresponding port. In the absence of fax/access codes, the call is defaulted to device port #1. Outbound calls are processed in the normal fashion with barge-in protection. The emergency barge-in (EBI) feature allows up to four user designated device ports to seize the phone line for critical outbound calls. HACKER SHIELD PROTECTION | Programmable Security Access Codes, up to 7 digits per port, protects connected devices from unauthorized access for a robust telephony firewall. Caller ID “Store & Forward” | CID is sent to device on first ring. Multiple Line Seizure Ports | Up to four device ports can now be designated for emergency line seizure for critical applications. LED Status Display | Seven segment display shows port in use & programming value read-back. Audible read-back tones are also provided for remote programming. Data Disruption Protection | Prevents active calls from interruption by another device. Remote Programming | ACP’s can be securely programmed by a remote administrator.